Stuart Jones has been to a pre-event press conference in Munich that outlined where MAN sees itself at present, discussed future strategy, announced its plans for electromobility, gave the low down on some of the new products and revealed tantalisingly little about others. MAN Truck & Bus CEO, Joachim Drees, is a man who has had high powered roles in a number of areas of business, including a decade with Daimler, six years in finance in London and two with a very successful concern belonging to his family, but came back to the commercial vehicle sector because he enjoys the complexity of it, taking up the role in April 2015. He gave an overview of the three stage strategy MAN is following to 2026 under the name ‘Future Lion’. It is currently in a stage entitled PACE 2017, PACE standing for performance, accountability, commitment and execution, in which it targets an €880m (£736.1m) improvement in operating profit by the end of 2017. It has seen the concentration of coach manufacturing at the Ankara plant in Turkey and Starachowice in Poland progressively become the centre for the complete construction of city buses with the former Poznan workforce to manufacture the Volkswagen Crafter range. 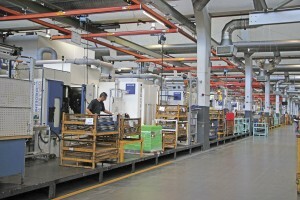 The former Plauen coach plant has become a Bus Modification Centre (BMC), producing bespoke conversions of the group’s products. At the end of 2017 it moves to the second stage that involves a market and product focus in which it aims to: become a top employer, be the best in the market at looking after customers, reach sales of at least 125,000 units (100,000 trucks, 18,000 vans and 7,000 buses) having become a full range manufacturer and achieve a return on sales of 8%. 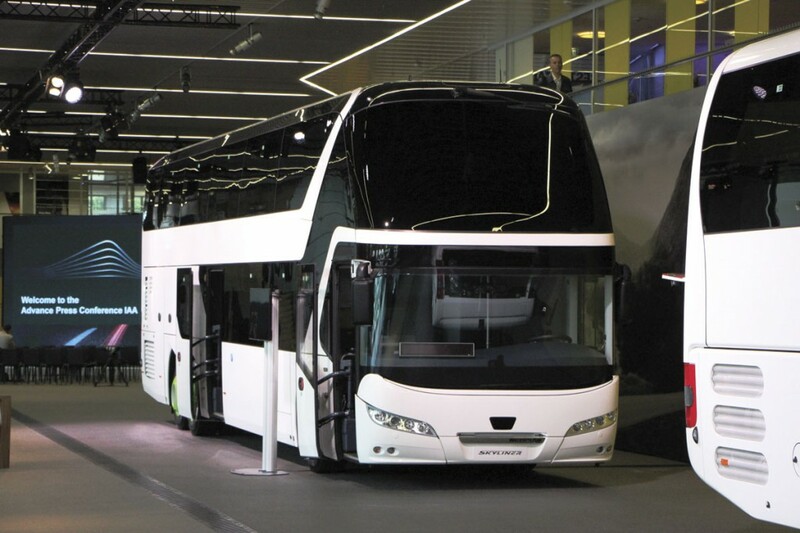 The two brand strategy (MAN/Neoplan) will be retained as the business seeks to maximise the advantages of the unprecedented €570m (£476.8m) research and development investment committed to in 2016. 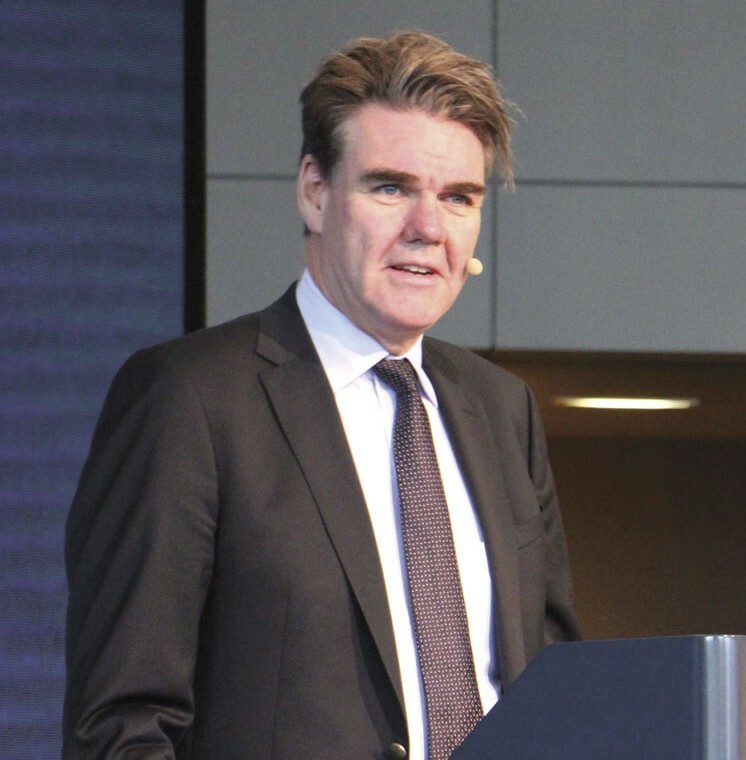 The third stage, referred to as the extended business model, running from 2012 to 2016 is designed to see MAN become a leading player for digital solutions in the commercial vehicle industry, commenting, ‘We believe digitalisation will change the business model.’ To prepare for this the 70 strong team working on digitalisation has been boosted to 120 people working on projects relating to telematics and remote management among others. He said bodybuilders would be able to use MAN’s digital platform as part of their future. Future Lion would see cultural change at MAN. He wanted to ensure sustainable success in the future and wanted everyone to regard change positively. The target was a team oriented performance culture, having fun when they were working, and he believed the company was going the right way. He concluded by saying that the business was on track, bus sales were going well and he believed Rudi Kuchta (Vice President Sales – Bus) and his team were doing a good job, having earlier mentioned the achievement of an increase in bus sales of 20% to 6,000 units in 2015. 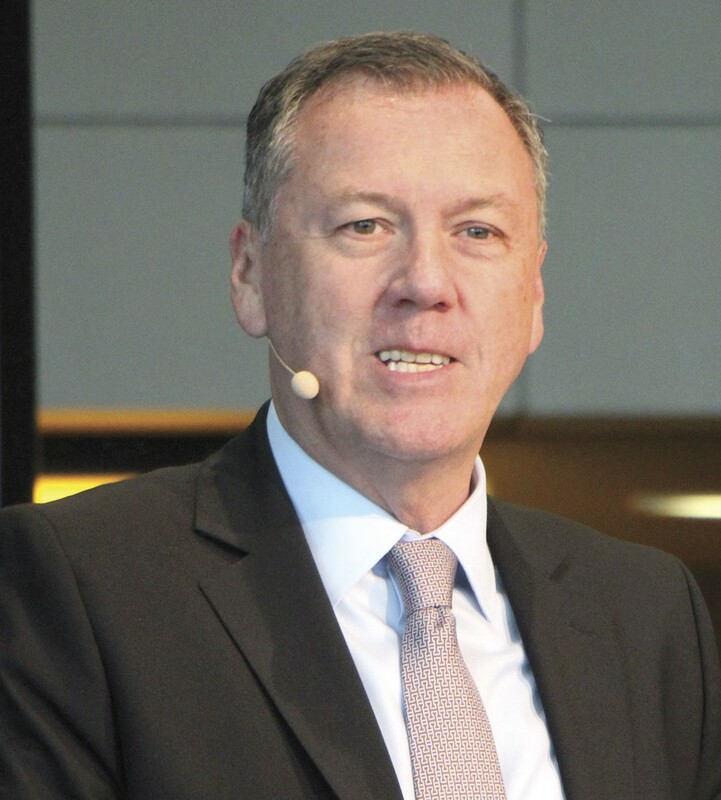 Heinz-Jurgen Low, Executive Board Member, Sales & Marketing, said that across the board, the size of the market would decline in 2016 pointing to Russia, Africa and Brazil as problem areas. In Brazil’s case 2015 had been disasterous and there was no light at the end of the tunnel for 2016. Overall, MAN’s share of the European truck and bus market was 24% and its share of the over eight tonne bus market had risen to 13.9%, up 2.9% in the first quarter of 2016. Significant deals included hybrids to Barcelona and Madrid in Spain, CNG Lions City buses to Ljubliana (30) and Miskolc in Hungary (75) and in the Far East, 247 double deckers to Singapore and Hong Kong on the three axle A95 chassis with bodywork designed by MAN and built by Gemilang in Malaysia. These orders take to over 800 the number of buses supplied by MAN to Singapore. 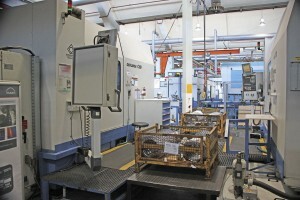 Significant low entry chassis business had been won in Manila in the Philippines where Frolich Tours has taken 65 units. A relationship has been built in Australia over the past three years where MCV bodied citybuses are supplied. On city buses he said the future of public transport would focus on e-mobility and at the IAA the company would present a modular solution, having already defined an e-mobility roadmap. A 100% electrically driven city bus would be in production by the end of 2019. Launched last year was the Lions Intercity and an extension to this range will be a 63 seat 19.5 tonne version which is 13.25m long on two-axles. Heinz-Jurgen also referred to the company’s Customer First programme which has the target of making MAN customers the most satisfied. The company believes its competitive situation can be advanced by having happy customers and it will be focusing even more on proper dialogue with them. 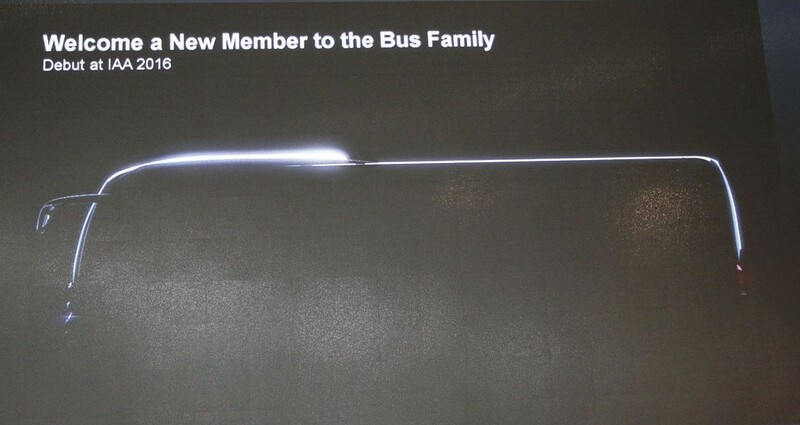 He concluded his presentation with a profile picture of a new coach to be unveiled at the IAA that has an aerodynamic profile 20% better than its predecessor. This was pretty much all that was said about it, with no word on whether it is an MAN or a Neoplan or both, what sector it is aimed at, which markets it will be available in or what the options are. Though it was slightly frustrating not to have seen it at this event, part of me welcomes the opportunity to go to a show where we really will see things we haven’t seen in advance. 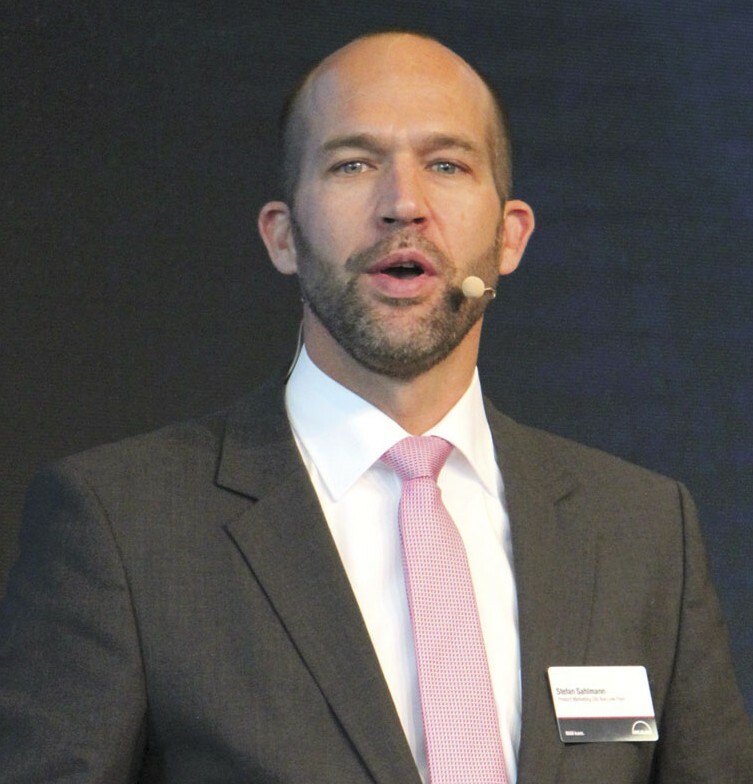 Thomas Nickels, Head of Engineering – Powertrain, looked at recent engineering innovations on the bus and coach product range. He reminded everyone that the next stage of emissions legislation is Euro6C which becomes mandatory in June 2017 in Europe. Under it, there will be no further tightening of NOx and particulate limits but there will be a lower on board diagnostics (OBD) threshold requiring more stringent NOx control and tighter adherence to the in use performance ratio (IUPR). To achieve this, MAN is employing an SCR catalytic converter with a more reactive substrate that fully extracts the unwanted elements more quickly and as a result both optimises combustion and reduces consumption. The engine portfolio under Euro6C will be the 6.9-litre DO8-LOH at 250hp and 290hp, the 10.5-litre D20-LUH at 280hp, 320hp and 360hp, the 12.4-litre D26-LOH at 420hp, 460hp and 500hp and, for gas applications, the 12.8-litre D28-LUH at 272hp and 310hp. The 400hp version of the D20 is being dropped at Euro6C. At Euro6C the D26 engine will benefit from: a new regulated coolant pump that avoids temperature peaks; peak cylinder pressure raised to 210bar (from 190bar); new shorter steel (rather than aluminium) pistons; longer con rods with steel anti polishing rings to prevent carbon build up; an oil cooler with integrated oil thermostat to reduce friction; and an optimised exhaust gas turbocharger and EGR system. Now certified for use with paraffinic fuels such as HVO in line with EN15940, it also has the EVBec electronically controlled motor brake as standard, reduced fan requirement and optimised momentum and volumetric efficiency channels within the cylinder head. To complement this, there have also been changes to the moving off and gearshift strategy in the TipMatic gearbox (a derivative of ZF’s AS-Tronic) that include fast shifting between gears and more comfortable driving at idle speed without the need to press the accelerator. The EVBec continuous engine brake system has been strengthened with electronic control of back pressure, added safety while braking at top speed and enhanced comfort at lower speeds. A hydrodynamic secondary retarder gives a maximum brake torque increased 4,000Nm in conjuction with the TipMatic box, as well as a bigger reserve during heavy braking and more confident braking when the long axle ratio is selected. The new longer rear axle ratio option is 2.73:1 which gives an engine speed reduction of 13% (169rpm) compared with the 3.15:1 unit, saving fuel and reducing noise. And when we’ve all got used to Euro6C there is Euro6D to look forward to in September 2019. Stefan Sahlmann, is responsible for the Product Marketing of the Low Floor City Bus and he ran through the options available from MAN, admitting that only fully electric vehicles fulfil the market requirement for zero emissions. 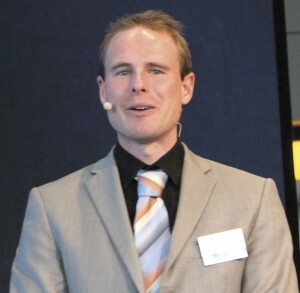 He predicted that electric vehicles would increase from 15% of the city bus market in 2020 to 60% of the market in 2030. 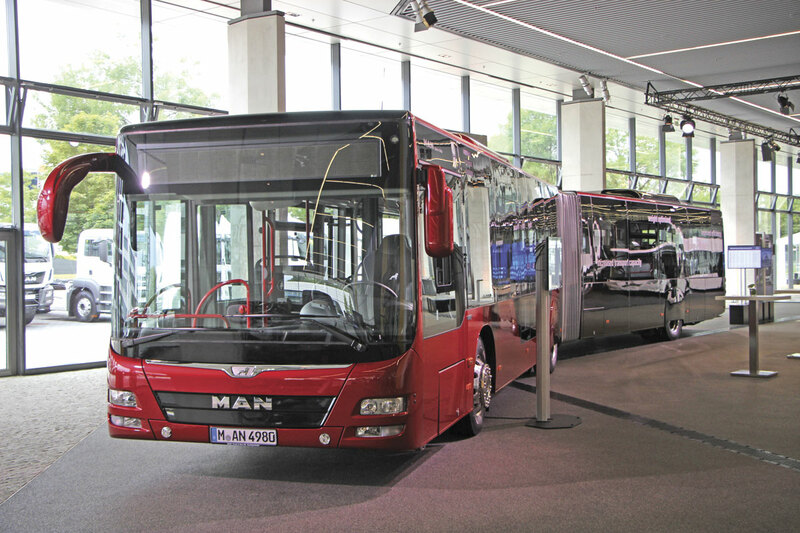 MAN’s approach was to focus on battery electric vehicles, which it refers to as BEVs, for city bus applications. It believed there was still huge potential for improvement in battery technology although fuel cell technology would also be tracked. 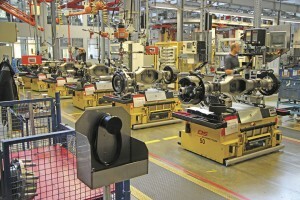 The central motor was to be evaluated as the best concept for electric drive train solutions. MAN’s solution would look at electric or hybrid energy for the HVAC system to reduce energy consumption. Stefan believed MAN benefited from long term experience with serial hybrid drive trains and an ‘Intra VW Group’ providing solutions for power trains and batteries that would ensure a competitive advantage. The solution would be modular and would be applicable to both bus and truck. Modular battery packs would enable customers to specify range and capacity and there would be modular charging systems to account for all charging strategies and operations. He claimed MAN’s solutions would be as individual as its customer demands. MAN would be producing a full range of 12m and 18m battery electric vehicles with overnight and opportunity charging options and the first demonstration buses for customer test would be available at the end of 2018. 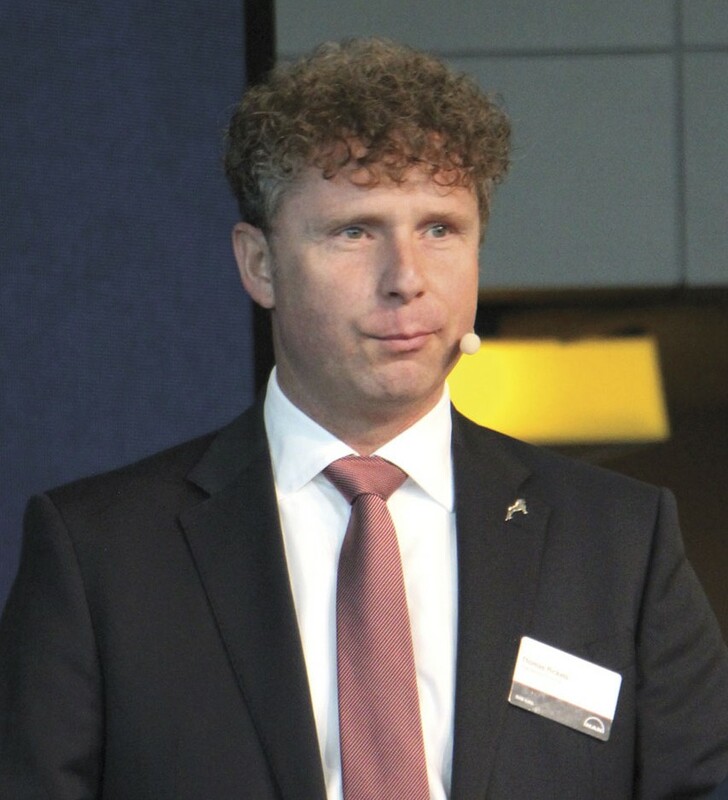 It was already working with two leading operators in Hamburg on the development of its eBus. 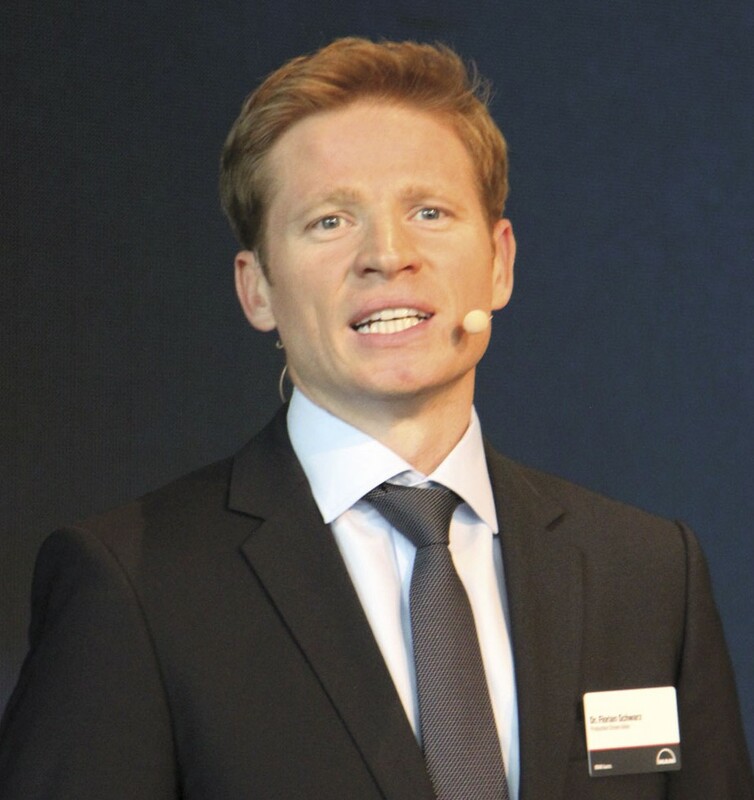 Giving an independent view of the technology, Jan Becker of RWTH University, Aachen, went through the strengths of different battery and charging types among other topics in a presentation that became increasingly absorbing as it went on. I was particularly interested by slides that showed the relative well to wheel efficiency of different engine types when the calculations of the electric vehicles were based on electricity generated other than by renewable means. This revealed that when electric energy was generated by means of brown coal, a diesel bus achieving 40litre/100km (7.062mpg) would produce 1.07kg of CO2/km, whereas a battery bus requiring 1.5kWh/km (based on 85% efficiency to drive train) would generate 2.06kg of CO2/km. Against these, a fuel cell bus (based on 33% efficiency to drive train) would generate 5.31kg CO2/km. Based on Germany’s current electricity mix the comparatives are: diesel 1.07kg CO2/km; battery bus 1.05kg CO2km and Fuel cell bus 2.71kg CO2/km (and though he didn’t say so the diesel would presumably carry more passengers). Only if vehicles ran on completely renewable energy would the diesel at 1.07kg CO2/km perform at a significant disadvantage to battery and fuel cell which in this scenario would be zero Co2/km. Not extensively referred to, nor displayed, was the new TGE van which will be unveiled at the IAA. It will be a rebadged version of the latest Volkswagen Crafter and will be offered through MAN dealerships. Minibus versions are to follow. I understand the UK will be in the second phase of the rollout programme, the first stage being centred on the Germanic markets. I am told that the maximum GVW available will be up to 5.9 tonnes. A small number of vehicles were displayed for journalists to see in order to illustrate points made during the presentations. 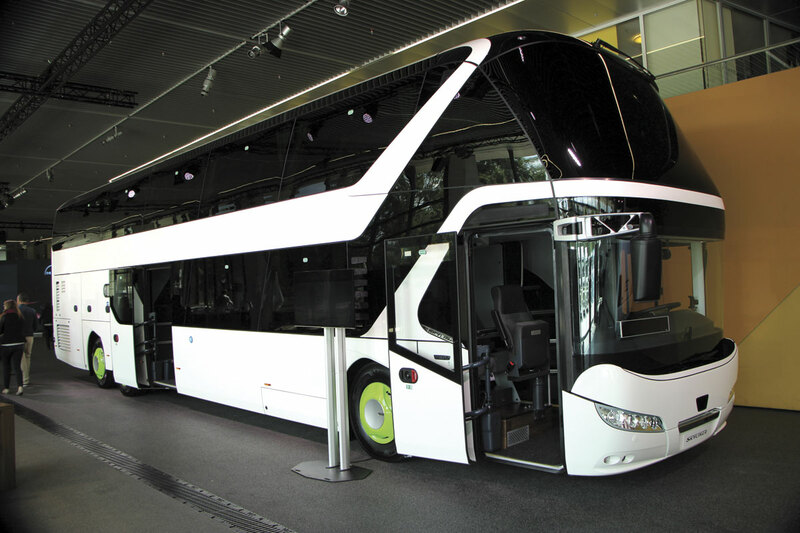 These included the articulated 17.98m Lion’s City G three-door city bus shown at Kortrijk last year which incorporated a number of features that together reduced the overall weight by 250kg. It was powered by a 360hp D2066 10.5-litre unit developing 1,800Nm at 1,000-1,400rpm and Voith DIWA 6 transmission with Sensotop and retarder. 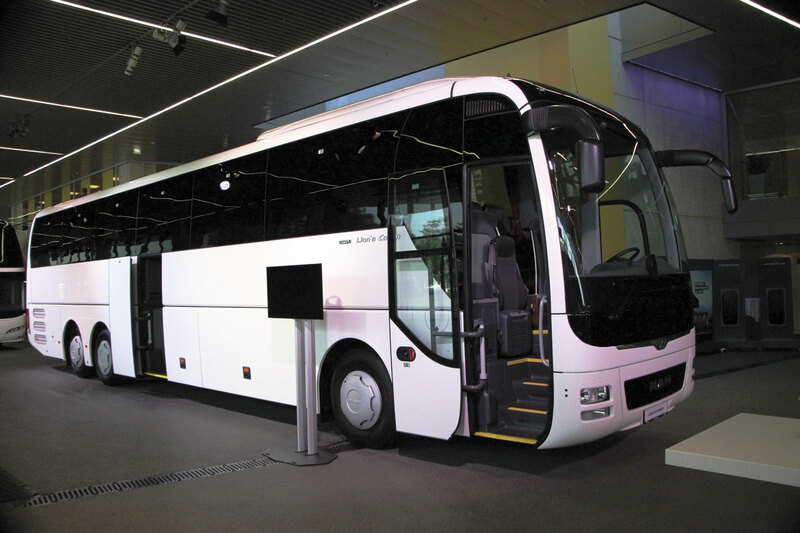 Coaches shown were a 14m double deck Neoplan Skyliner and a three-axle 13.8m MAN Lion’s Coach L equipped with the latest Euro6C engine. The 57 seater Lion’s Coach with flat wood effect floor, toilet and servery, featured the Euro6C D2676 LOH 12.4-litre engine which produces 500hp at 1,800rpm and peak torque of 2,500Nm at 930-1,400rpm. It is matched to the 12-speed TipMatic automated transmission with intarder and has Efficient Cruise and Efficient Roll fitted. The Skyliner was destined for express work with Flixbus as the vibrant green wheel covers attested, and was fitted with the wheelchair access features required by law in Germany since the beginning of the year for express work and set to become mandatory across Europe. Seating 77, 57 of them on the upper deck, the Skyliner was powered by the 505hp D2676 LOH engine which develops 2,300Nm at 930-1,400rpm and had the 12-speed TipMatic automated transmission. During the course of our visit we were given a presentation by Dr Florian Schwarz, Production Engineer, Assembly Driven Axles & Transfer Cases and afterwards shown around the driven axle manufacturing plant, which is located a few streets away from the Truck Forum in Munich. 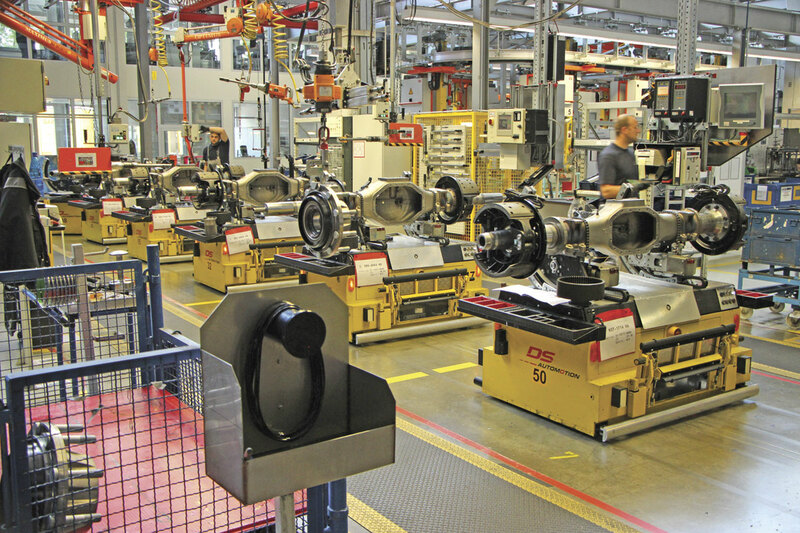 The plant opened in 1955 and employs 650 people, producing between 90,000-110,000 driven axle units annually, as well as 55,000 drive-through axles and 6,000 transfer cases. 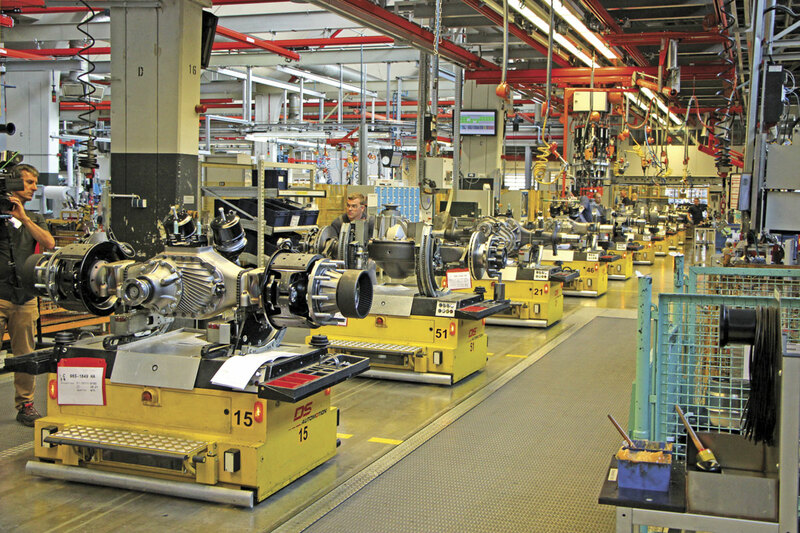 The overwhelming majority of production is devoted to axles for trucks, with both hypoid and hub reduction units produced, but around 5-6% of the hypoid axles and 3 – 4% of the overall axle production is for coach applications. 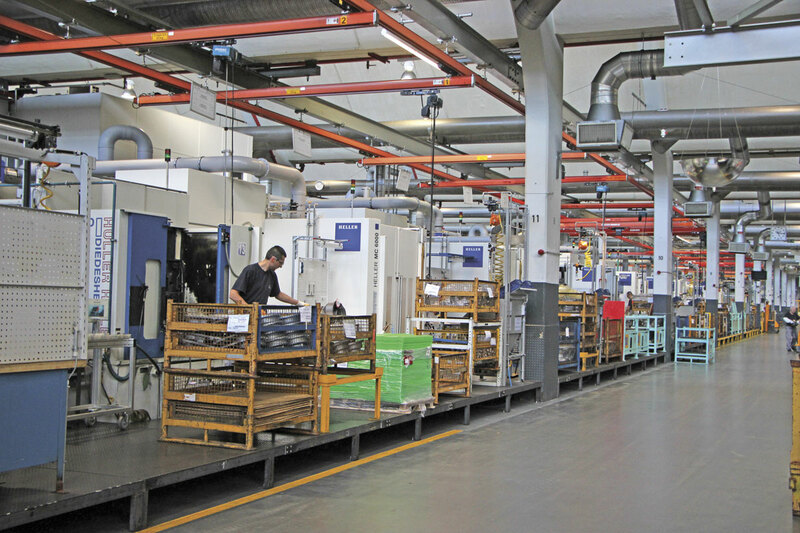 Non driven axles are manufactured at the plant in Salzgitter, which is also currently the location for bus and coach chassis manufacturing. 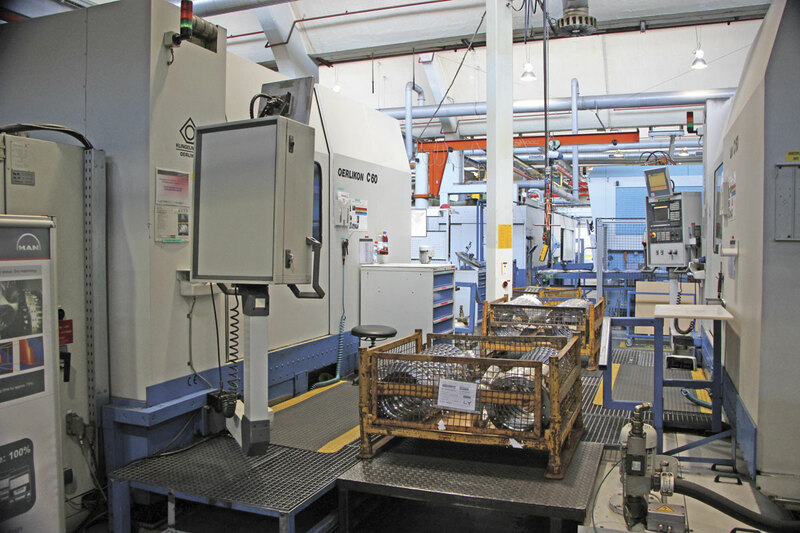 Forged components are supplied to the Munich plant and go through a series of manufacturing stages within it, including ten hardening stages and a variety of milling and drilling procedures. Major investment has seen 20 new Heller machines installed over the last three years, the latest four in March this year, MAN works with the company to constantly reduce the tolerances to ensure ever greater quality. Lower tolerances (some down to one micron) mean increased lifetime and lower noise. Every stage is meticulously logged and the details (including photographs of each unit at some stages), are logged within a central system where they can be easily referred to. For the assembly stages, the axle casings are fixed to automatic guided vehicles which move automatically around the plant and carry the information the assembly team need to know about what the product is and what parameters they need to work to. There is a lot more to the manufacturing process but unfortunately we do not have the space to go through it in detail here. Each hypoid axle goes through 26 separate steps taking about an hour to do so, after which it spends three to four hours in the paint facility. Externally, it is difficult to see the difference between the finished truck and coach axles but inside different processes are employed. The biggest difference is that the gears of the coach units are ground, whereas those of the truck are lapped, grinding giving the better process stability characteristics. Whether the gears are geared or lapped makes little difference to the drive-by noise. Coach axles also undergo additional gear alignment checks. 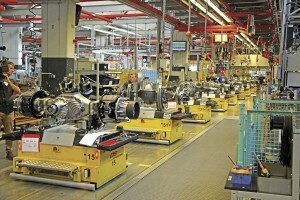 Once completed, axles are wrapped and trucked to the Ankara plant for incorporation in models including the Lion’s Coach and Neoplan Cityliner. Beginning in 2017, Munich is to commence producing non driven axles for Scania trucks, an early sign of integration within the wider Volkswagen group. The new management team at MAN is upbeat about the way things are going, encouraged by recent orders and the prospects for the future when all of the planned new models are available. In this respect, it does appear to be significantly behind the ball where full electric availability is concerned, though it is by no means alone among manufacturers in being so. In the UK, I understand there are no immediate prospects of a renewed assault on the bus market but there must be optimism about the sales prospects for the new coach once the current management vacuum has been filled. The company is determined to put the difficulties experienced with the Euro5 D20 engine behind it and the signs are that the Euro6 range, now focused on the D26 for coaching applications, is enjoying reliability levels in line with traditional MAN expectations along with reduced fuel consumption. With the new coach and the TGE van range making their debuts, MAN’s presence at the IAA in Hannover in September promises to be among the highlights of the show.